See marrakechtailormade.com and Facebook for more information. Dan Bachmann – Why we travel Many talks have been given on the general philosophy of ‘why we travel’. This time, it is a very personal story of hitting the road and following the heart. Brian Anderson – Images From The Edge. Brian Anderson, Wirral based photographer and adventurer, has travelled to 55+ countries and territories around the world. Join Brian for a portfolio of his stunning wildlife and landscape photographs from some of the coldest and most spectacular landscapes in the world, and a look at some of the explorers who ‘discovered’ these frigid places. 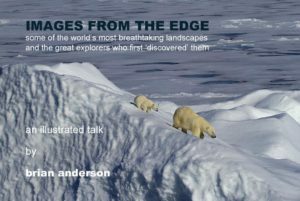 This Illustrated Talk features the great explorers, Ferdinand Magellan, John Weddell, Ernest Shackleton and Roald Amundsen, plus the unique wildlife, including; whales, seals, penguins, walruses, albatrosses and polar bears, that has adapted to survive in these inhospitable worlds. Travelling tens of thousands of miles, we will see icebergs and frozen seas at the North Pole, the wonderful wildlife of South Georgia, the Weddell Sea in Antarctica, and the inhospitable but amazing coastline of Tierra del Fuego. There is something here for everyone. This talk is a must for adventurers, those ‘afflicted with wanderlust’, or those who prefer travelling to very cold places from a comfortable armchair. By tradition we follow this meeting with a New Year Party post-meeting – everyone is invited to bring food and drink and participate!